The design and release details for the Perth Mint’s 2011 Gold Kangaroo coins were recently revealed. Featuring a fresh rendition of one of Australia’s most recognizable animals, the 99.99% pure gold coins will be available in bullion weights ranging from 1/10 ounce to 1 kilo. The new design features the image of a kangaroo superimposed on the rays of the rising sun. The inscription “Australian Kangaroo” appears above with the date “2011”, bullion weight, and “9999 Gold” below. The “P” mint mark for the Perth Mint appears between the rays of the sun. This new design is used for the four smaller bullion weights of the 2011 Gold Kangaroo. Following with tradition, the 1 kilo size coin carries a classic kangaroo design by Dr. Stuart Devlin AO CMG. Obverse designs of each coin feature a portrait of Queen Elizabeth II with inscriptions “Elizabeth II”, “Australia”, and the legal tender face value. The Gold Kangaroo will be available for worldwide release on September 14, 2010. Maximum mintage levels have been established for four out of the five different bullion weights. The specifications and maximum mintages for each coin appear below. 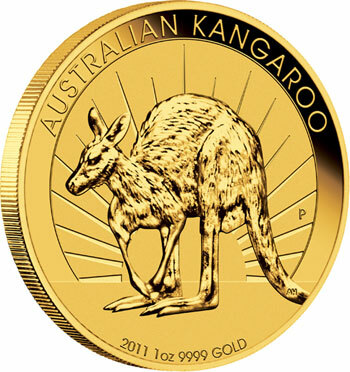 The Gold Kangaroo has been offered by the Perth Mint of Australia since 1989 with a different reverse design featuring the kangaroo for each year. The series was previously known as the Gold Nugget, which featured famous Australian Gold Nuggets from 1986 to 1989. The Kangaroo looks angry or like it has Rabies.